Independently of archive and history text, the tradition of Hebridean hospitality has happily retained living substance, so that soon after approaching the little croft at the head of the bay with my request for a gallon of water I was seated by the fire at the kitchen table of Mrs Catherine Ross. Her ‘You’ll be staying for a cup of tea’ was more of a forceful suggestion than a statement of ‘second sight’, but Hebridean ‘tea’ equally deserves a place in immortal folklore and is not to be missed, for the reference of the word is far wider than on the mainland. Within minutes I was tucking into homemade scones, oatcakes and several mugs of strong, hot brew under the jealous gaze of Bobbie the labrador, who could apparently see no reason why such service was denied to him. The homely chat and kitchen warmth began to make me drowsy and I was concerned that the kayak should be hauled securely above the incoming tide; but I was only able to leave that croft by accepting a bag of fresh scones and butter and promising to let Mrs Ross know when my journey was safely completed, for until that time she would not sleep for worry. ‘It’s a good thing you’re not married – and it’s sorry I am for your poor mother!’ Smiling, I made my way back to the tent, my hands warmed by the scones only slightly less than her kindness had warmed my heart; but it was not ‘kindness’ that I ate so gratefully for breakfast next morning. Outside the shelter of Loch Finsbay a heavy swell began to trouble me as I headed towards Renish Point, the southern tip of Harris. An increasing south-easterly from the Minch, and decreasing visibility, made the five-mile journey to Rodel a hard push and by the time I reached the shelter of the small harbour my lungs were heaving. The Presbyterian Sabbath had dropped a shroud of silence and inactivity on Rodel and it would have pleased me to call it a day and make camp, leaving the Sound of Harris until conditions in the Minch were more settled, but with the tide at an advanced ebb the sea was unhappy in the little harbour and broke heavily on the rough, bouldered bays. Landing would have meant damage to the kayak, if not also to its occupant, so after a snack and a breather in the lee of a small islet I opted for an exposed dash around Renish and into the Sound. Beyond Loch Rodel the large and random waves of the Minch were bottlenecking at the entrance to the Sound, curling threateningly and snarling white at the caps. Negotiating the restricted passage between the Point and the various islets and reefs which lie offshore in that heaving sea was for all the world like riding a rollercoaster, with the proviso that the responsibility for avoiding those needle-like rocks remained firmly in my own hands! Around the point and the sea was now surging from behind. Lean forward. Steady. Move WITH the waves. Whoa! Keep off those rocks! In poor visibility, among dangerous reefs, with cold and fatigue growing, you can’t fight that kind of sea with impunity for long, so I hauled out at a small, shingled inlet. Although only three miles from Rodel, I had at least reached the Sound of Harris; another significant corner had been turned and tomorrow, weather permitting, I would head towards the open Atlantic. Mist obscured North Uist and the islands south across the Sound, but I could still see the Minch piling up and breaking at the windward bottle-neck through which I had so recently passed. With tomorrow’s timing in mind I sat on the rocks above the Sound and tried to interpret the flow of the tidal streams. Not a particularly rewarding study! It seemed that different streams were flowing in opposite directions at the same time. Furthermore, where these streams met there were whirlpools and overfalls which appeared and disappeared without regular pattern. Despairing of this practical investigation I consulted the Admiralty Pilot Guide Book, always a guru in times of doubt; however it only confirmed my confusion: ‘ … In the Sound of Harris tides defy concise rational explanation.’ Despite a night of rough weather and a pessimistic forecast, blue skies and light winds welcomed the first day of July. I climbed a knoll and ate breakfast looking out across the Sound to the uninhabited islets of Killegray, Ensay and Pabbay, breeding haunts of the huge Atlantic grey seals, the ‘Ron Mor’, the biggest land animals in all Europe. Bleached cumulus anvils were reflected in the reformed body of water and I no longer sought concise rational explanation for it was to be a day of constant beauty, sunshine, and one of the best day’s canoeing I’d ever had. At full tide I watched a solitary cruising shark make its way westward and marvelled at the sheer size of it, the largest fish of northern seas. The distance between the first dorsal fin and the yawing tail must have been twenty-five to thirty feet, and its bulk greater than a bus, I guessed, before it submerged with the slow sinking action characteristic of the sharks. Using pieces of a broken wooden ship-mast as rollers I eased the loaded kayak across the rocks and into the water, following the shark out past the Carminish Island group. It was an easy morning’s paddle with none of the delinquency of yesterday’s seas; the novelty of sunshine and calm water continued to amuse me, and the white beaches of Killegray and Ensay winked through a water-level haze as I pushed through the Sound, Atlantic bound. Taking advantage of the continuing warmth I stopped for an early lunch at a bay of soft sand beneath the distinctive bulbous promontory of Toe Head. The seal islands of Shillay and Coppay had joined the panorama, but over lunch I was preoccupied with the name of the beach, Traigh na Cleavag, and thought it would be a good name for a nudist haunt. Then a short walk across a narrow neck of pasture-land opened, to the north, a view which hit me with sledgehammer effect and almost reduced me to my knees with its blistering perfection. It was a cameo image of Hebridean paradise, that incomparable combination of deep blue water, shading shoreward into aquamarine, fringed by lightning-white surf on beaches of a hue of gold that was almost pink. Never had I seen anything so right. A series of such beaches stretched north, like an ornate golden bracket, to the Hills of Harris, now hazy in the sun’s reflection, and the Island of Taransay framed the view to the west. The deep green of the Machair, with its carpet of clover, buttercup and tormentil, added a final dimension and completeness to the scene and I was in love all over again. 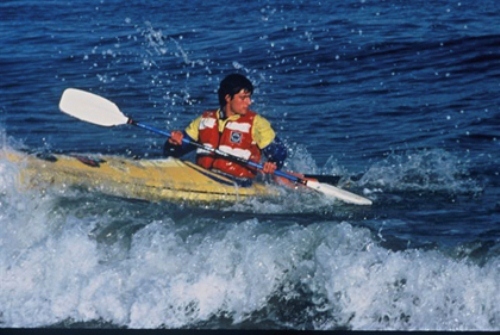 I turned and ran back to the beach across the machair, clover-heads catching and pulling between my bare toes, for before I could become part of that scene I had to bring the kayak around wide Toe Head. Even on such a profoundly calm day, there were the first signs of a true Atlantic swell. Lumbering regular breakers arched their backs and vented brief lives against the island shores with powerful explosions of spray which told of the stubborn power source always latent below an ocean whose surface showed barely even a ripple. It was my first taste of the restless Atlantic, almost forty million square miles of water representing thirty per cent of the earth’s water-cover and extending north-south for 13,000 miles, half the earth’s circumference, where some of the worst storms of which nature is capable are born. Between here and the east coast of Canada I knew there was nothing but two thousand miles of open ocean, across which many early Harris emigrants, forced from their land, set off, but never arrived on the other side. It was a pleasure to be able to run the bows up on sand without fear of damage to the fibreglass and my eighteen-foot companion was dwarfed by the sheer extravagance of Traigh on which we eventually alighted. 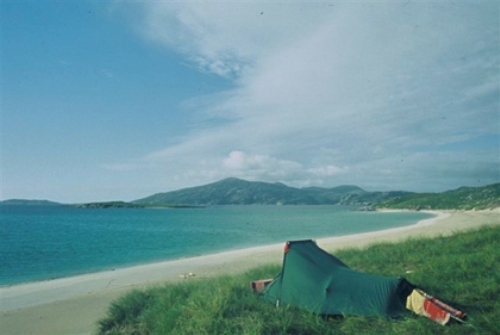 After several journeys to ferry essential gear I had established a camp high on the Machair with a view across sweeping dunes to the island of Taransay. Here was isolation, ‘true solitude without a policeman’, and in a primal response to the seductive qualities of sun and sand (and perhaps an unacknowledged memory of ‘Dr Stan’) I removed my salty clothes and relaxed my legs and shoulders with a loose jog along the beach followed by a baptismal plunge in the Atlantic. As the cold brine eased my aches and chaffs and soothed sunburned extremities I reflected on what had been a day of success and beauty such as I had seldom, if ever, experienced. All the time of my growing up on the east coast I knew that somewhere there had to be a place like this, and that some day I’d find it: the far western seaboard of the Outer Hebrides. I found it to be everything I’d ever dreamed it might be, and vanished into its welcoming smile, with a slight inward apology for leaving it so late. 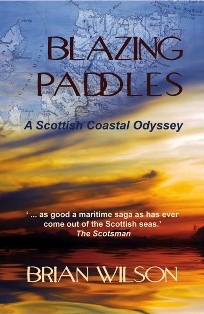 Blazing Paddles: A Scottish Coastal Odyssey, was originally published by Two Ravens Press in 2008. In 2012, is was made available as an e-book. Both print and digital formats are available from the Two Ravens Press website. As a publishers, both through the press and the recently-launched Earthlines magazine, Two Ravens are – in the words of the Herald – undertaking “a quiet publishing revolution”. You can read more about their philosophy here. This entry was posted in Books, Journey on April 4, 2012 by Paul Scraton.